Survivor: Millennials vs. Gen X (2016) - Winner, 10-0-0. Received 10 jury votes to win, in Episode 14, "I'm Going for a Million Bucks" (Day 39). Millennials vs. Gen X Ep. 1 RC/IC: "Got to Choose" - Helps gather clubs then watches, as Millennials win. Millennials vs. Gen X Ep. 2 RC/IC: "The Ocean" - Grabs a key, but the Millennials lose. Millennials vs. Gen X Ep. 3 RC/IC: "Going Coconuts" - Lets Taylor take his bag on the balance beam; Millennials win. Millennials vs. Gen X Ep. 4 RC: "Water Slaughter" - With Jay, loses his bout to David/Chris; Millennials lose, 3-2. Millennials vs. Gen X Ep. 4 IC: "Angry Chair" - Sits out, as the Millennials eventually win. Millennials vs. Gen X Ep. 5 IC: "Holy Diver" - Now with Takali, swims for a buoy; Takali doesn't lose (2nd*/3). Millennials vs. Gen X Ep. 6 RC: "Blind Faith" - Blindfolded, collects puzzle pieces; Takali loses (3rd/3). Millennials vs. Gen X Ep. 6 IC: "In the Bag" - Sits out, as Takali loses again (3rd/3). Millennials vs. Gen X Ep. 7 RC: "Matt Finish" - Releases bag, moves balls along with Jessica; Takali loses (3rd/3). Millennials vs. Gen X Ep. 7 IC: "Bail Out" - Sinks coconuts, unlocks key; Takali wins (1st/3). Millennials vs. Gen X Ep. 9 RC: "All Mixed Up" - Grabs the key and pushes the crate for the losing team. Millennials vs. Gen X Ep. 10 RC: "Ferryman" - Grabs a key, solves the puzzle (with Zeke) for the winning team. Millennials vs. Gen X Ep. 11 RC: "Slither Me Timbers" - Unable to make up a deficit on the puzzle, purple team loses. *Note: Second-place finishes during the three-tribe phase of MvGX count as half a win. Millennials vs. Gen X Ep. 8 IC: "Fools in the Rain" - 11th to drop out, circa 20 minutes (3rd/13). Millennials vs. Gen X Ep. 9 IC: "Bow-Diddley" - Seventh to drop out, third stage (4th/12). Millennials vs. Gen X Ep. 10 IC: "With a 10 Ft. Pole" - Eighth to drop out, in the fourth and final round (4th/11). Millennials vs. Gen X Ep. 11 IC: "Rusty Cage" - Still in cage, one of nine people tied for second (tie-2nd/10). Millennials vs. Gen X Ep. 12 RC: "Rope A Dope" - Stuck on the under-log crawl as Jay wins (tie-6th/9). Millennials vs. Gen X Ep. 12 IC: "Push Me Pull You" - Outlasts everyone, and Adam wins! (1st/9). Millennials vs. Gen X Ep. 13 F8 IC: "Wizard's Staff" - One of five people on the last phase as Jay wins (tie-4th/8). Millennials vs. Gen X Ep. 13 F7 IC: "Pinball Wizard" - Drops out to help Ken win (7th/7). Millennials vs. Gen X Ep. 14 F6 IC: "Tower of Power" - One of several in the running, but does not win (tie-2nd/6). Millennials vs. Gen X Ep. 14 F5 IC: "Draw the Line" - Almost has the entire puzzle solved when Ken wins (2nd/5). Millennials vs. Gen X Ep. 14 F4 IC: "Operation Balance Build" - Intentionally halts ahead of David (3rd/4). Millennials vs. Gen X: None. Millennials vs. Gen X, Ep. 4: Finds first the clue, then the Millennials idol (Day 11). Millennials vs. Gen X, Ep. 8: Finds the reward-stealing advantage (Day 21). Millennials vs. Gen X, Ep. 12: Gives the advantage to Jay at the Loved Ones visit (Day 31). Millennials vs. Gen X, Ep. 12: Plays his idol for Hannah, voiding four votes against her (Day 33). Millennials vs. Gen X, Ep. 14: Finds and plays a second idol at Final Five; no votes voided (Day 37). Millennials vs. Gen X, Ep. 6: 'Figgy' Figueroa (voted out, 3-2). Millennials vs. Gen X, Ep. 8: Michelle Schubert (voted out, 9-4). Millennials vs. Gen X, Ep. 9: Taylor Stocker (voted out, 7-4-1). Millennials vs. Gen X, Ep. 10: Chris Hammons (voted out, 7-4). Millennials vs. Gen X, Ep. 12: Zeke Smith (voted out, 5-). Millennials vs. Gen X, Ep. 13 (F8 vote): Will Wahl (voted out, 6-2). Millennials vs. Gen X, Ep. 13 (F7 vote): Sunday Burquest (voted out, 4-2-). Millennials vs. Gen X, Ep. 14 (F6 vote): Jay Starrett (voted out, 5-). Millennials vs. Gen X, Ep. 14 (F4 vote): David Wright (voted out, 3-1). Millennials vs. Gen X, Ep. 8: Four votes, from Jay, Michelle, Taylor, and Will. Millennials vs. Gen X, Ep. 9: One vote, from Taylor. Millennials vs. Gen X, Ep. 14 (F4 vote): One vote, from David. Millennials vs. Gen X, Ep. 14: Received 10 jury votes to win (10-0-0) from Michelle Schubert, Taylor Stocker, Chris Hammons, Jessica Lewis, Zeke Smith, Will Wahl, Sunday Burquest, Jay Starrett, Bret LaBelle, and David Wright. Ha ha, stereotypes about Millennials! Getting soaked right before dark? Seems unwise. Probst is in camp on Day 2? Figgy is definitely the target tonight, right? I'm really here with Jeff Probst! They're coming back already, sigh. These people are so dumb! He seemed pretty mad. Oh well. Oh. It's just a dumb advantage. Great. I want to vote Jay out right now! Oh. Also letters from home. Three threats: David, Jay, and... Will? No. We have to vote out Jay. Wait, Jay has an idol? Not a real one. Bye, Jay. Ken won, so we have to vote out David. Easy. Oops. One tell too many. Adam: David's been up here the whole game! David: Higher. 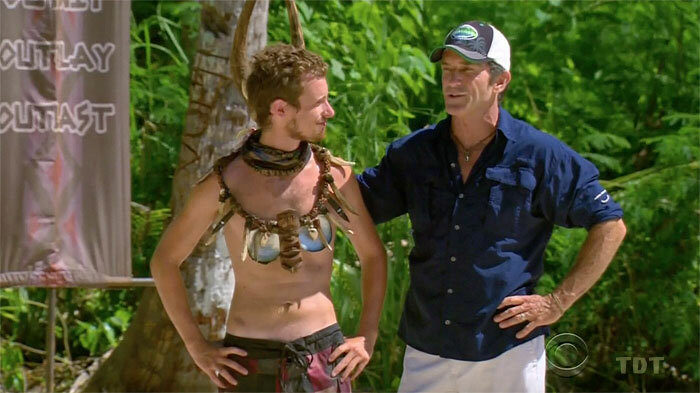 Gordon Holmes at XfinityTV.com (8/19/16): "Millennial Adam: 'Survivor Has Been My Dream Since I Was Nine.'" Josh Wigler at Parade.com (9/16/16): "Adam Klein Before the Game"
Gordon Holmes at XfinityTV.com (12/15/16): "Adam: Jay is the 'Batman to My Joker'"
Josh Wigler at Parade.com (12/15/16): "Adam Klein Explains His 'Hyper Focused' Path to Victory"
Rob Cesternino at RHAP (12/15/16): "Finale Top 6 Interviews with Kim Spradlin"
Dalton Ross at EW.com (12/15/16): "Adam talks about the show's most emotional finish ever"
Dom Harvey & Colin Stone at the Dom & Colin Podcast (1/4/17): "Adam Klein Examines Millennials vs. Gen X"
"Inspiration in life: My mom. She is surviving lung cancer and has survivorship in her blood [because] her mom survived Auschwitz. She is incredibly physically fit and otherwise healthy. She can tear up the dance floor—that's where I get my moves!—and she's my best friend and supporter. If you could have three things on the island, what would they be and why? A picture of my family to keep myself grounded and focused, a fake hidden Immunity Idol because the threat can be just as powerful as the real thing, and a razor because I hate mustaches with a fiery passion. Survivor contestant you're most like: Spencer Bledsoe (Cagayan, Cambodia). We are both wise beyond our years, can easily play up to the egos of older and stronger players, are strategic thinkers, and are widely underestimated in the game. I also relate to the never-say-die nature and social finesse of Hayden Moss (Blood vs. Water). 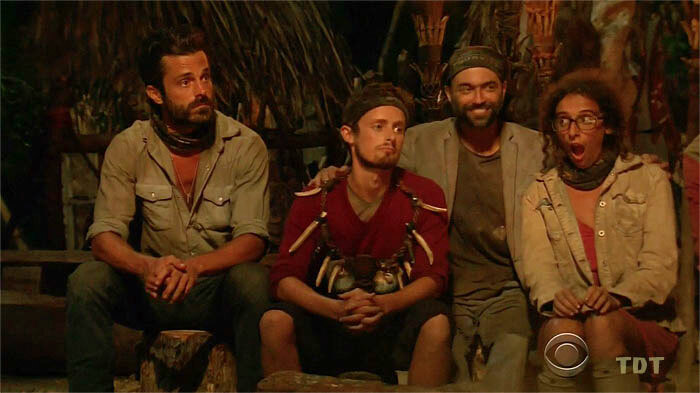 Why do you think you’ll "survive" Survivor? No one is going to fight as hard as I will for that title. I may be—and look—young, I may be small, but my fellow competitors won't know what kind of power punch I pack until they are already knocked out. I will use my youthful charm and energy, combined with my strategic nature to win. I come from a long line of real-life survivors, and I am next."